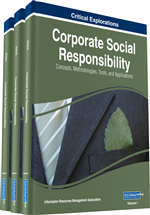 Corporate Social Responsibility (CSR) is a relatively new concept in Turkey. Leading companies including banks stress socially responsible activities in their marketing communications. The recent economic crisis put banks into the center stage again. Turkey was one of the few countries that emerged from the economic downturn relatively quickly. In the initial stages of the crisis, banks faced some criticism for protecting their self-interest more and not acting for the benefit of the society. Later, these criticisms got weaker and less frequent. This chapter examines the behavior of banks during the crisis with respect to CSR and social marketing. Particularly, the chapter analyzes how the banks behaved during the crisis and how they supported small and medium scale enterprises and local communities through CSR strategies, as well as how they utilized CSR efforts as a marketing tool. In addition, the outcome of these strategies is discussed. Turkey underwent a deep economic and financial crisis in 2001. This crisis was a culmination of the years of wrong policies and delayed structural reforms. One of the reasons for this crisis to be severe was the almost total bankruptcy of banking industry. State owned banks acted with political motives more than commercial ones. Private banks concentrated just on financing the public sector, borrowing from the Central Bank and the public, and lending to the government. Consequently, some of the banks were taken over by the Savings Deposit Insurance Fund; eventually either their licenses were revoked, or they were merged, recapitalized and privatized. Before the crisis, there were a total of 81 banks, 61 of them were deposits banks. Now, the number of deposit banks is 31. The cost of the restructuring banking industry was about 30% of GDP. Some private banks that survived the crisis merged with other banks or sold some equity to international banks. Fortunately, the crisis and restructuring took place under international benevolent conditions. The new Central Bank Law and the Banking Law reduced political intervention greatly and established a fair competitive environment. Kaytaz and Gul (2014) argue that having experienced the 2001 crisis was one of the reasons why Turkey recovered from the 2008 recession relatively quickly. The banks are classified as deposit, participation (Islamic), investment, and development banks. There are 31 deposit banks and they have almost 92% of total banking assets (Bank Association of Turkey, 2001). Seven of these 31 banks own 73% of the banking assets; they are classified as large-scale banks.